It’s all in the way you spin it. matter what life throws in their path. ruffled or out of place. I firmly believe) – spin doctors. down in large doses 3 times a day. of those who inhabit the real world know, it takes effort. And that’s when you need to spin it. you free to watch cheesy noontime shows. with work to even go to the grocery? words, and a dish which I find equally comforting. and onion and sauté until the onion is soft and translucent. until both the wing beans and pork belly are soft. bright side are all things I find comforting. eat it in front of a computer screen. That is a fabulous dish! The flavors are wonderful. I was just saying to the hubby that I miss eating bicol express, but this is something that's gonna be on the menu this week! Will have to sub another kind of green bean for the wing beans though! Thanks!! Oh my goodness…I love this dish, we also make it at home the same way except that we add fish/shrimp to it instead of pork. Have a great easter break! Whewww, that looks really good. Hi Ling! I love Bicol Express and this dish was definitely inspired by it 🙂 This would be good with another type of green bean too I am sure! Hi Chef D! I can imagine this going really well with shrimp! Enjoy your Easter as well! Hi Dexie! I love it 🙂 Nice homey flavors! Taking advantage of being in HK to open your blog and dropping a quick note. I've never tried this before but it looks like a tasty dish! Of course, anything with coconut milk, for me, is a winner! I have never heard of anything like this before which makes me want to try this even more!! 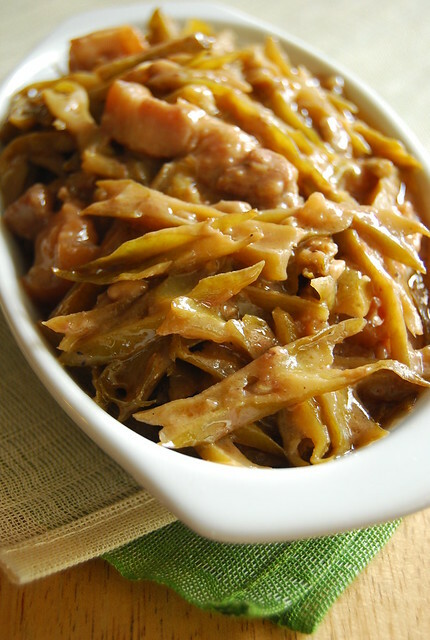 What a twist on classic Bicol Express! Despite the sultry weather we've been having of late, I'll not say no to a generous helping of this on rice! Hi Mila! So nice to hear from you!! A big happy Easter to you as well!! Hi David! It’s just some of the flavors from our group of islands! And this dish is definitely part of that bright side. Looks lovely! That looks like one intense dish. Like many others, I bet it would be really good with shrimp, or maybe even chicken! I wish you the best on this busy week, but I imagine you won't need well wishes. You are already so sunny and sweet. I love pork belly, but I've never made it myself. So good! Hi Normal Food For Normal People! It is quite intense 🙂 And yes, this would work with chicken and would be awesome with shrimp! Hi Redmenace! Thank you for your nice comment 🙂 I love pork belly too…it is such a versatile and easy cut to play around with…I encourage you to give it a go! It's in the way you spin it… I love how you put it. There are day when this is exactly what i need, being the pessimist that i am… Thanks for sharing!